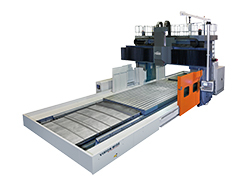 BM series 5 faces machines, with typical VW products features of rigid structure and high precision, is unique by the features of movable cross rail and W-axis feed cutting synchronic with other axial feeding. The max. height for work piece & machining is 2,450mm & 2,400mm.